At this very moment, I’m drinking a cup of coffee brewed from a Keurig machine — and I can tell you with 100% certainty that it tastes like a stale, bland, watered-down version of the fresh stuff. In short, it tastes awful. This may be an unpopular opinion: Pod-based coffee appliances — such as the Keurig brewing system — have infiltrated the homes and offices of millions of American coffee drinkers. In fact, they’re the second most popular brewing method after traditional drip coffee pots. Yet the sudden explosion of these single-serve coffee machines is a paradox. Yes, coffee gadgets minimize preparation and clean-up time in an increasingly fast-paced and stressful working world. But in addition to being horrible for the environment (at least for the non-reusable pod versions), many critics join my lament that the stuff these machines produce tastes at best mediocre, if not like tepid sludge. To get some insight, I spoke with Elisha Nuchi, a wholesale manager at Cafe Grumpy — a small-batch coffee roaster and brewer in Greenpoint, Brooklyn — with over five years of experience working in coffee. I also contacted Keurig, which leads the single-serve coffee market, to understand their sourcing and packaging process. The company declined to answer some of my questions. Here’s what I could gather about why Keurig and other single-serve brewing systems taste so bad. One of the biggest reasons pod coffee tastes horrible, Nuchi told Tech Insider, is that by the time it gets to you, the coffee has already begun to go stale. Most flagrantly, the coffee has been ground days, weeks, possibly even years before you drink it, Nuchi said. By pre-grinding coffee and packing it into neat little vacuum-sealed pods, the end user gets the ultimate easy brewing experience. All you have to do is pop a coffee-filled pod (if you’re brewing with a Keurig, it’s called a “K-Cup”) into the machine, hit a button, and within seconds, you have a sufficiently warm cup of joe. But the grinding process immediately exposes the beans to oxygen, triggering a chemical reaction that zaps the flavor and aroma. This reaction causes coffee’s tasty, aromatic chemical compounds to degrade via oxidation — the same reaction that makes iron rusty. “Once you grind it,” Nuchi said, “it starts deteriorating immediately.” For this reason, baristas recommend that you brew your coffee shortly after grinding the beans. While Keurig does try to thwart further degradation by vacuum sealing its grinds into pods (and possibly infusing them with preservative chemicals, though Keurig declined to comment on whether or not they do this), the oxidation damage to the beans may have already been done before they’re packaged. When raw coffee beans are roasted under high heat, the complex internal mixture of minerals, carbohydrates, amino acids, proteins, lipids, water, and caffeine meld together inside the bean, giving way to the nutty, irresistible smell and taste of coffee. Just like with grinding, coffee beans begin to degrade and lose their tasty flavor the moment they’re roasted and then exposed to air. For this reason, many — but not necessarily all — roasters suggest that you brew your coffee soon after roasting to get the freshest, most delicious drink. But freshly-roasted coffee presents a problem for packaging: After the beans cool, they release plumes of trapped carbon dioxide (CO2) gas from anywhere for a few days to several weeks. The most rapid release occurs during the first few days after roasting, which then tapers off to a more gradual release over weeks. While coffee manufacturers want to package newly-roasted and ground beans into an air-tight container as soon as possible to seal in the freshness, the CO2 plumes present a problem. When beans or grounds are actively releasing CO2, the gas could cause the sealed container to blow up like a balloon and pop. Many coffee companies insert one-way air valves into tightly sealed bags to allow the CO2 to escape, but with an air-tight K-Cup, you can’t really do this. To thwart this issue, manufacturers will wait until the CO2 is fully released, which can require up to 15 days, before they package their roasted and ground coffee. But during the wait, as we learned above, the coffee becomes more and more stale by the day as it’s exposed to air. I asked Keurig how long they wait after roasting and grinding their beans before packaging into pods and how they account for degassing, but they declined to answer. Considering that their pods aren’t bursting with CO2, it’s probably safe to say that they wait days or even weeks after roasting to make sure the beans aren’t actively giving off CO2 before packaging them. To make matters worse, Nuchi said, you can’t tell where the coffee was sourced from and how recently it was roasted and ground. This makes ascertaining the quality and freshness of a given package near impossible. I asked Keurig’s public relations team what kind of beans they use and where they’re sourced from and, again, they declined to answer. A spokesperson from Keurig (who did not want to be named) said that even Keurig employees aren’t able to tell when a particular package of coffee was roasted and ground. There’s only a “best by” date on each box that, the spokesperson said, is the only way to “ensure freshness” (which itself is a loose, subjective term). According to Nuchi, coffee in a pre-sealed K-cup could be sitting for months or even years before it gets to you. And not knowing where the coffee came from makes it impossible to judge the quality. “My guess is the less transparency they have [on the package], the likelier it’s lower grade,” Nuchi said. “Especially in the coffee industry, people are proud of where the coffee comes from and when it was roasted.” This lack of disclosure, Nuchi says, may very well mean the quality is not that great. Besides the quality and age of the coffee, another important taste-sucking aspect of Keurig machines is that they don’t heat the water to a high enough temperature for optimal extraction and taste. According to their website, Keurig machines are pre-set to brew at 192 degrees Fahrenheit. But according to the National Coffee Association (NCA), optimal brewing temperatures are between 195 and 205 F.
Brewing at anything below 195 F leads to “flat, under-extracted coffee,” the NCA says. Finally, one last problem with the Keurig and other pod coffees is in the amount of time that the beans are in contact with the water. 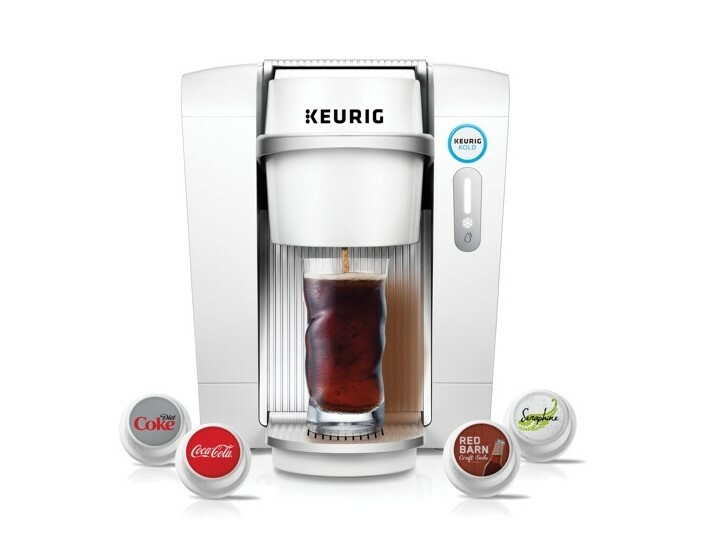 Keurig prides itself on getting you a hot cup of coffee quickly. But many good things shouldn’t be rushed, including a tasty cup of joe. The National Coffee Association recommends that for a cup of drip coffee, the hot water should be in contact with the ground beans for about five minutes. The Keurig brews its coffee in mere seconds. This, combined with the lower-than-recommended water temperature, leads to a flat, weak cup of coffee. Will it ever be good? This question is hard to answer. There’s probably a ton of research going into perfecting the experience of the single-serve coffee machine because it’s such a profitable business, Nuchi said. Keurig alone took in $4.5 billion in sales in 2015. There may be ways to flush the beans with chemicals, such as nitrogen, to preserve their integrity. But Nuchi said that even then, he’s not sure this would help the already-ground beans. Companies are even starting to want to put Cafe Grumpy coffee into pods for use in single-serve machines, but for all of the reasons listed above, Nuchi said, Cafe Grumpy is not considering this. In short, the most attractive part of a single-serve coffee machine is also its biggest downfall when it comes to taste: Quick, easy-to-use prepackaged coffee will never taste fresh. Next articleStarbucks Says “Ciao”: How Significant Is the Italian Market For Its Growth?